Whether you’re just starting out or are a seasoned Sales Development Representative, there’s always room for improvement. Which is why we compiled the 11 simple actions all SDRs need to take. These techniques lay the groundwork for success. Read on to see the tricks and tools you can use every day to get ahead. Sick of writing the same emails over-and-over again? Try a free Yesware trial. 1. Become an expert on your product or service. A Sales Development Representative is the face of the company. Why? Because in most cases, you’re the only person at the company your prospect will know. If you don’t know your product or service like the back of your hand, your prospect will see right through you. Take the extra effort to meet with different departments (product, marketing, customer success, engineering) to understand their perspectives of the product. Meet with more experienced sales reps on your own team to do role-playing exercises where they can throw FAQs your way. If possible, use your product or service so that you can get the firsthand experience of what it’s like to be a user. 2. Familiarize yourself with the ideal customer. Before you even begin to research, you’ll need to know who you’re looking for. Decision makers: Who will ultimately make the call to sign the paperwork. Advocates: Who does the research, takes the calls, and passes along the information. End users: Who will be engaging with your product or service on a regular basis. Who does the contract signer listen to? I.e. They won’t sign if [who] dissents? Who will I interact with beyond the sale? 3. Find out who fits the bill on LinkedIn. What’s the fastest way to track real-time company changes? Researching on LinkedIn. Once you know who your ideal persona is, you can starting plugging in your research. How? Use the search functionality. When searching, you can narrow it down by putting quotations around your queries. Pro tip: During your research, take notes of their accomplishments, your commonalities, and their interests. Then, use this template to transform your research to create customized sentences. 4. Keep tabs on your competition. Keep your friends close, but your competitors closer. Or, at least know what they have to offer. A great sales development representative knows exactly how their competition stacks up. How to do this: Create a “battle card” for reference. In column A of the spreadsheet, list out price, features, customer dissatisfaction with the competitor, where you win, where they win, and customer stories. In row 1 (starting with your company) list out your competition and fill in the information. 5. Take the consultant approach — solve with them, don’t sell at them. Before you reach out, remember that you’re a consultant. As a sales development representative, you’re there to find people who need your service. If you just pitch at a prospect and string them along, you’ll waste everyone’s time (including your own). You can take the consultant approach by putting your prospect’s needs first. Listen to their problems to see if it’s a good match. If it isn’t, be transparent about that. 6. Don’t just send a cold email — build rapport. I’m going to show you the one simple formula you need to get cold email replies. It’s called the PBR. Personalization — Find an interest and put your prospect front-and-center. Benefit — Help them imagine the end picture; don’t just spell out features. Request — Try to open up a conversation. Just because you’re sending a cold email doesn’t mean it needs to live up to its name. As humans, we love personalization. It’s even proven that hearing the sound of your own name brings you joy. So, instead of barging into their inbox, take the time to build trust and break the ice with the right conversation starter. How to do this: Find a movie they love (on Facebook or Twitter). Identify a character and at least one well-known attribute that you can relate back to your product or service. What end benefit do they both share? Hungry for more? Here are 7 more cold email templates that’ll turn heads. 7. Use email tracking to determine the best time to call. Calling prospects right after they’ve opened your email can result in a 32% higher connect rate. So instead of leading yourself blindly into a cold call, rely on a simple sales tool that gives you the details you need. How to do this: Use email tracking to see when your messages are being opened (and on what device) so you find that serendipitous moment to make the call. When your prospect opens your email, you’ll see a desktop notification. This way, you know the right time to smile and dial. Bonus: We also created a free tool that shows a best time to send emails to your recipient. 8. Calculate how many calls you need to hit your quota. Instead of guessing how many cold calls you need to make to hit your goal, use the interactive worksheet below. Note: To adapt this worksheet for your own use, click here to open the original, then File > Make a Copy. From there, you can plug in your information. 9. 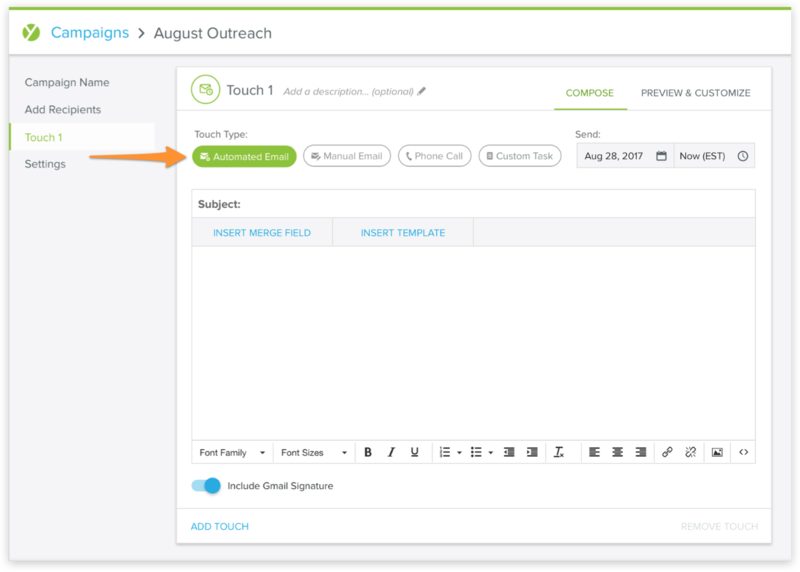 Personalize your outreach by using customized templates. Understatement of the year: As a Sales Development Representative, you write a lot of emails. And when you’re sending the same-style messaging over-and-over again, the last thing you want to do is waste your time. An easy way to stop the tedious work? By relying on email templates. Instead of taking time out of your day to find templates and guess what’s working, you can save emails (with placeholders) into a custom library that lives in your inbox. 10. Send follow-up emails when the timing is right. But can I let you in on a secret? Sending a follow-up actually puts you ahead of the game. Yesware data shows that 70% of unanswered sales emails stop after the first attempt. By sending a follow-up, you stand out as someone who keeps trying. How to do this: We have a tool for that. 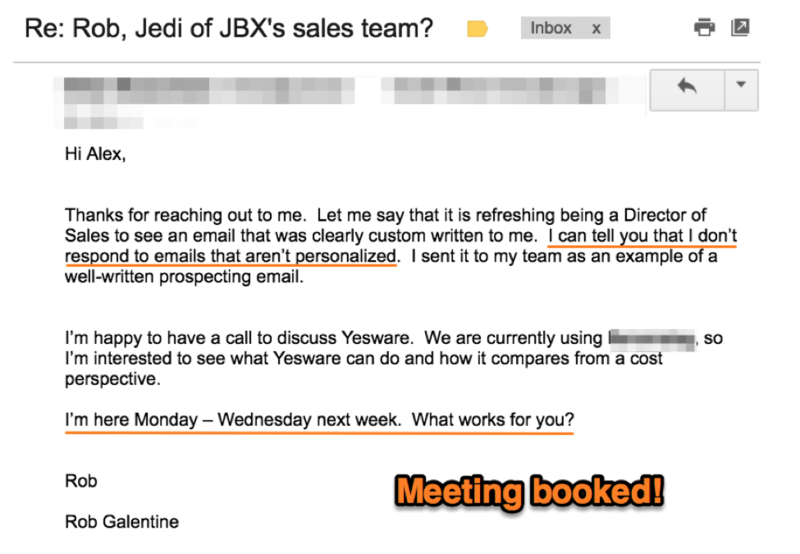 Yesware’s Campaigns lets you send automated email campaigns based on recipient engagement. 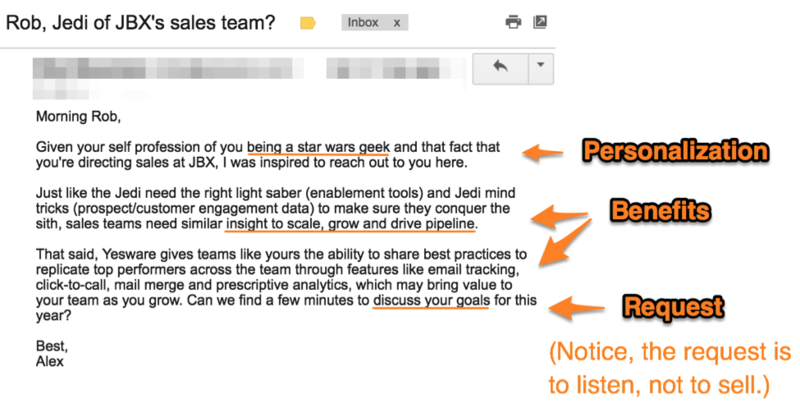 Need a follow-up email template? We got you covered. 11. If you have to put a pin in it, that’s better than burning bridges. Remember when I said you were the face of the company? That means making a good first impression and last impression. If your prospects already work with a competitor or the timing isn’t right, take the high road because you never know what might happen down the road. Contracts expire. Services change. People’s change their minds. Don’t tarnish your companies relationship with your prospect just because the timing wasn’t right.